Simon Grayson has backed the depth of his Preston North End squad to cover the loss of four players for Sunday’s derby clash with Fleetwood. Callum Robinson, Bailey Wright, Scott Wiseman and Alan Browne have all received international call-ups. While it is not ideal to lose a group of players in one fell swoop, only Robinson and Wright have been regulars in recent weeks. Lilywhites manager Grayson said: “We have got some missing for Fleetwood but at Barnsley we had six players sat in the stand who have played three-quarters of the season for me. “Whatever team we put out on Sunday, we will have players desperate to make their mark. Whatever team we put out on Sunday, we will have players desperate to make their mark. Robinson is in the England Under-20s squad for two games this week. Tomorrow night, they play Mexico at Barnet’s Hive ground, then on Sunday face the United States in Plymouth. Centre-half Wright has been recalled to the Australia squad for two friendlies. The first is against Germany in Kaiserslauten tomorrow night, then they fly on to Skopje to play Macedonia on Sunday evening. Wright has not featured for the Socceroos since scoring on his debut against Saudi Arabia in September. He underwent groin surgery in October and forced his way back into the PNE side last month. The 22-year-old’s recall is due to an injury to Western Sydney defender Matthew Spiranovic. Wiseman is gearing up for Gibraltar’s Euro 2016 qualifier against Scotland in Glasgow on Sunday. Midfielder Browne has been named in the Republic of Ireland Under-21s squad. Neither Wiseman or Browne have been in the PNE squad of late. Wiseman’s last start was at Oldham last month and he was on the bench for the next game against Doncaster. A hamstring injury kept him out of the visit to MK Dons and Calum Woods has been preferred ahead of him on the bench as defensive cover recently. Browne’s last appearance in the first team was as a sub in the Johnstone’s Paint Trophy second-leg tie at Walsall. Grayson took his full squad to Barnsley on Saturday and had to leave six of them – Jack King, Kyel Reid, David Buchanan, Josh Brownhill, Wiseman and Browne – out of the matchday 18. In terms of covering the loss of Wright and Robinson, the PNE boss has decent options. Skipper Tom Clarke is set to move into the centre of defence, with Woods coming in at right-back. Chris Humphrey and Andy Little are the choices to step in for Robinson. Humphrey had been on the bench for the last three games, Jermaine Beckford selected ahead of him in a three-man forward line. At Barnsley, Little came on as a late substitute – his first slice of senior action since the FA Cup win over Norwich on January 3. The Highbury Stadium clash is being televised live by Sky. It was selected for coverage in January, the two clubs having to give an undertaking then that they would not ask for a postponement should they get international call-ups. 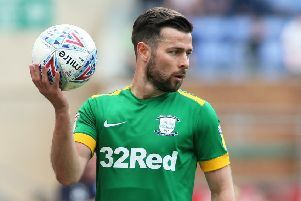 Fleetwood will have Conor McLaughlin missing, with the former PNE defender in the Northern Ireland squad. As it happens, he would have missed the derby game anyway after picking up his 10th yellow card of the season in the Cod Army’s 2-2 draw at Bradford City on Saturday. McLaughlin came through the ranks at Preston, forcing his way into the first-team squad as a teenager. He joined Fleetwood in July 2012.